The transition to the new Gruden era in Oakland has been a rocky one, to say the least. Eight months into his second stint as the team’s head coach, Gruden traded perennial All-Pro edge defender Khalil Mack to the Chicago Bears. A little under two months later he traded star wide receiver Amari Cooper to the Dallas Cowboys. With the start of the 2019 offseason in sight and a complete rebuild already underway, no holdover from the Reggie McKenzie era seems safe. Starting players like Derek Carr, Marshawn Lynch and Jared Cook have all been rumored for departure, but there is one player that Jon Gruden should seriously consider keeping around – and that is veteran center Rodney Hudson, who has become the best pass-blocking center in the NFL. Since entering the league in 2011, the former second-round pick out of Florida State has been almost unmatched as a pass blocker. 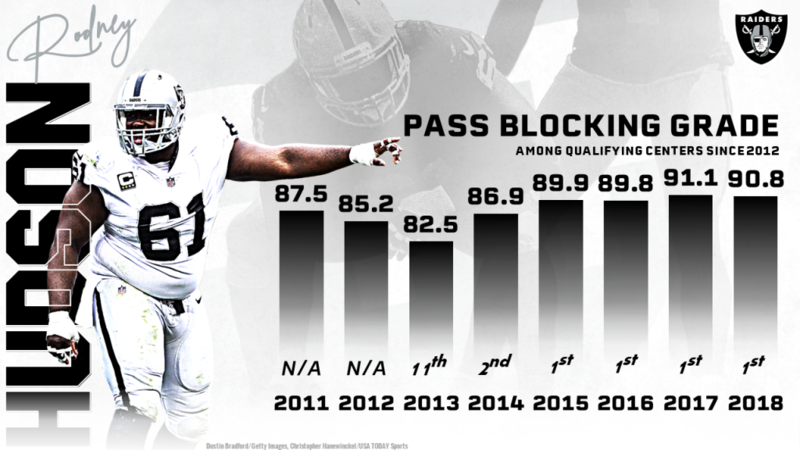 In eight full seasons, four with the Kansas City Chiefs and four with the Oakland Raiders, Hudson has earned eight single-season pass-blocking grades of 80.0 or higher, and he’s ranked first among centers in pass-blocking grade in four of those eight seasons. That makes him one of only five offensive linemen in the PFF era (Andrew Whitworth – 8, Duane Brown – 8, Joe Thomas – 11, Josh Sitton – 8) to earn 80.0-plus pass-blocking grades in at least eight consecutive seasons.